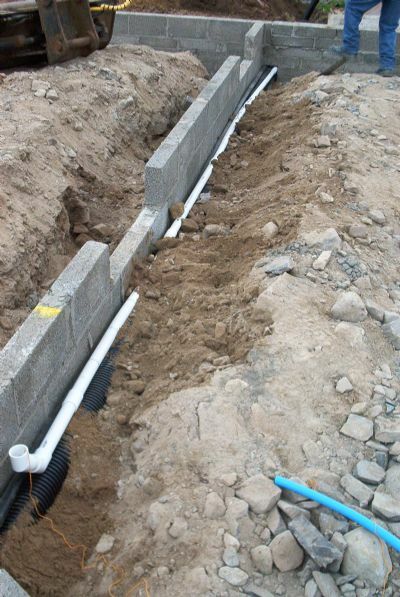 Service pipes are laid to "under stairs cupboard"
Trenches backfilled & internal floor levelled. DPC almost complete. 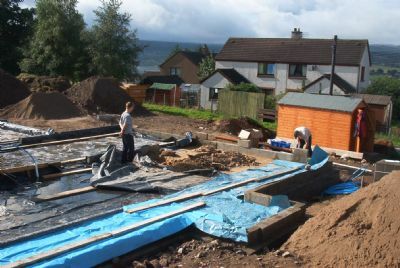 Site levelled ready for concrete sub-floor on Wednesday. 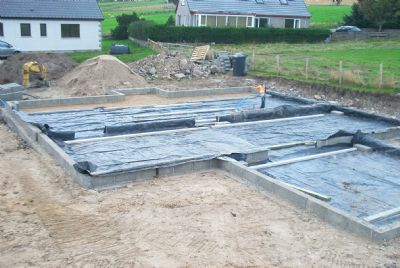 Heavy overnight rain, but it does not stop us bedding battens in concrete at the screed level for the sub-floor. Meanwhile John finishes laying the waste pipes for the downstairs bathrooms. 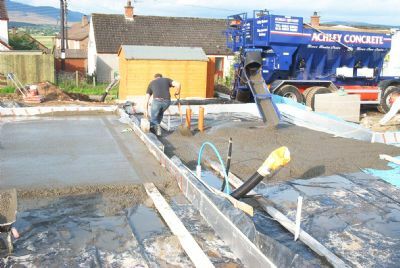 Donald returns with his concrete machine to pour 9½ cubic metres of concrete for our sub-floor (see VIDEO for more info). 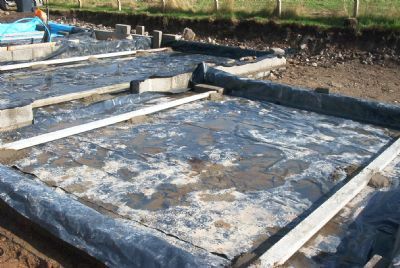 By lunchtime Bennie & Douglas have removed the screed timbers & finished levelling the floor. 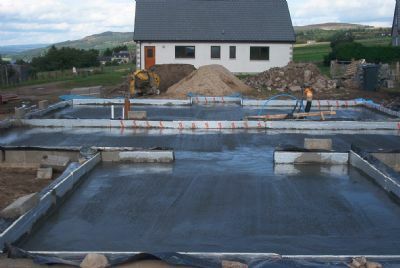 The weather is fine and hopefully the floor will set before the scaffold arrives tomorrow! 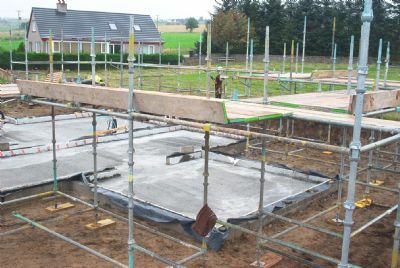 The sub-floor has set hard, and an early start for the scaffolders results in good progress by morning tea break. 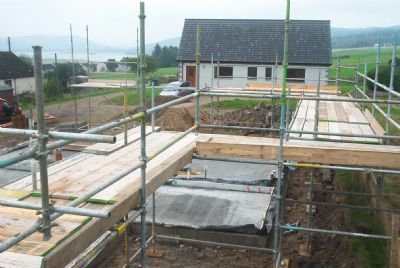 By lunchtime we have a scaffold along 3 sides of the building (one left open to allow access for the panels and trusses), and have also taken delivery of 10 m³ of underfloor insulation (a good platform for this photo). 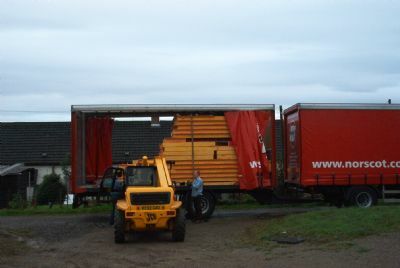 The Norscot lorry arrived at 8.00 a.m. and Gavin Ross starts unloading with his JCB teleporter. 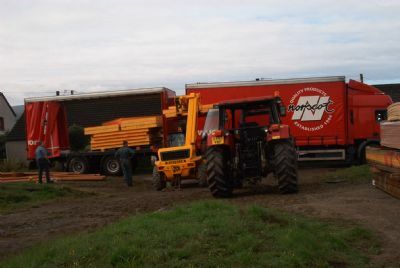 Unfortunately the JCB breaks down laden with panels in a most inconvenient spot, but Gavin saves the day by fetching his tractor and we complete the unloading, albeit mostly onto our neighbour's ground - many thanks to Pete and Sue (hope you don't mind)! 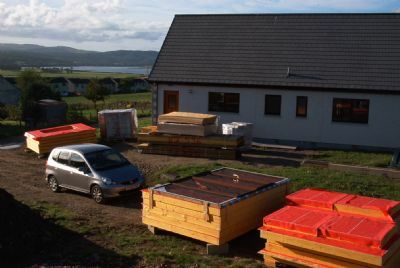 We finally get all the kit safely offloaded, and the scaffolders complete their work so we are ready for the construction to begin on Monday morning.